Grass cell pavers create a grassed area for pedestrian traffic or occasional vehicular traffic. They are ideal for wet areas, areas prone to soil erosion, such as turf driveways, and garden paths where grass is muddy after rain. Grass cell paving blocks encourage water infiltration, permit air, water and nutrients to move from the surface to the sub-soil and reduce runoff into stormwater drains. Grass roots growing down through the cells into the sub-soil bind and hold the turf paving blocks permanently in place. 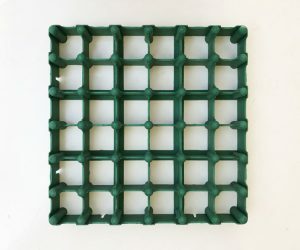 Each grass cell paver measures 370mm x 370mm and consists of 36 square cells, each 40mm high. Heavy Duty Polyethylene grass cell paving blocks can be sawn, filled, drilled or shaped with hand tools. Grass pavers connect together to form various patterns using moulded tabs and slots along the sides. Once laid, plastic cellular paving grids are filled with gravel or a good soil and seed. Our new design can also be infilled with min-paving blocks and provides a firm dry path to walk on. The high load-bearing walls (800Kpa) stand up to wear and tear, protect roots against soil compaction and support the weight of vehicles. Strong and versatile, interlocking cellular paving grids can also be used for agricultural applications, including cattle troughs.